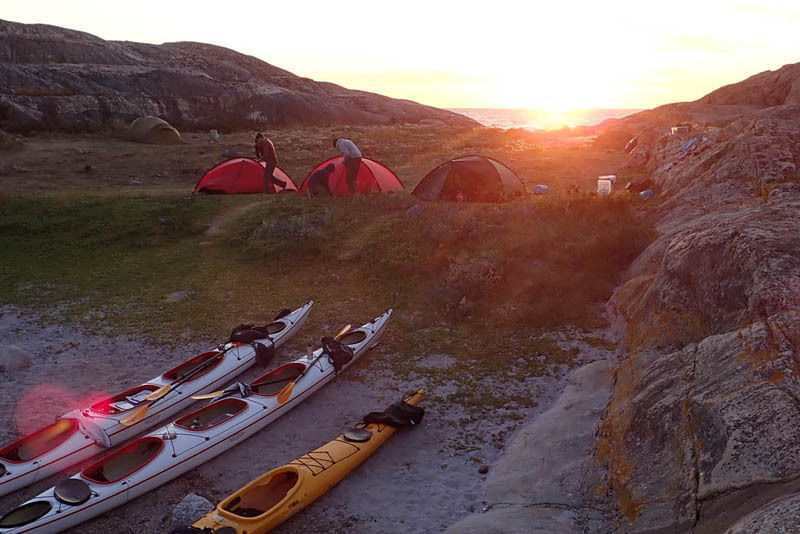 We provide all you need to create your own unforgettable adventure; self-guided kayaking and wild camping along Sweden's most beautiful coastline; The Bohuslän Coast. 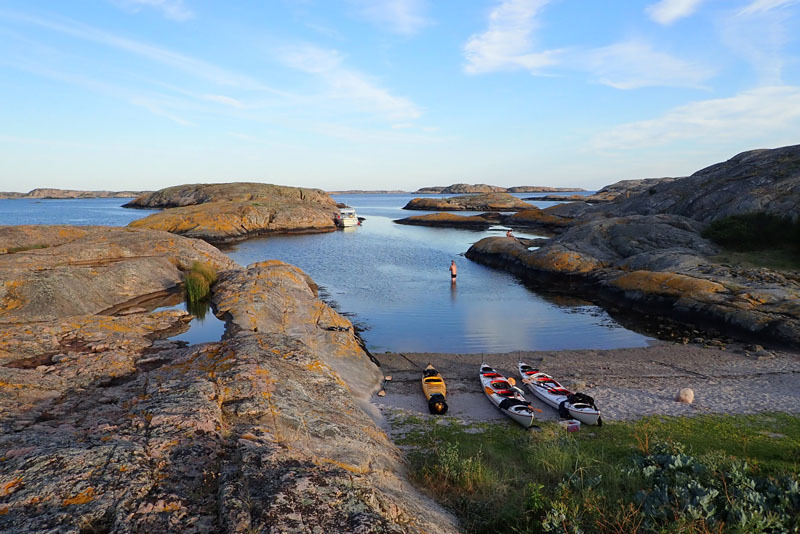 Kayak and wild camp among the 8,000 islands which make up Sweden's Bohuslän Coast. 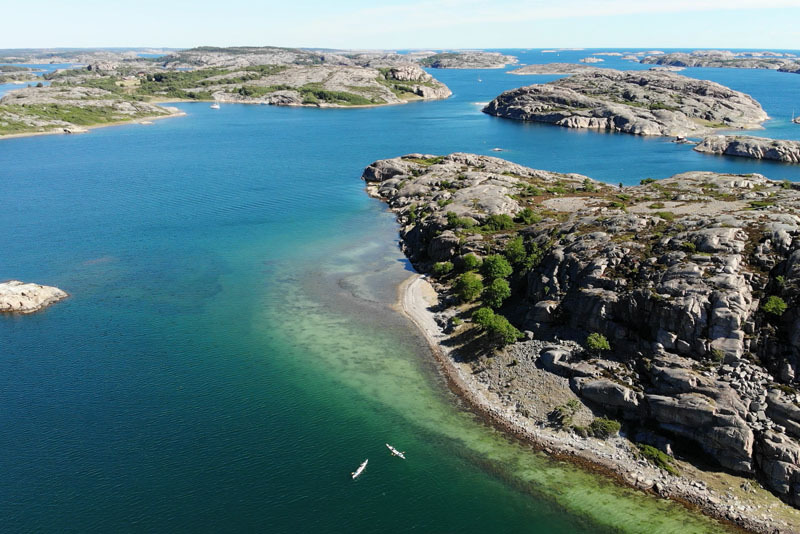 During the day; explore the calm sheltered waters around uninhabited islands by kayak, paddle crystal clear lagoons, sunbath on white sandy beaches and nature spot around Bohuslän's majestic terrain. Spend your evenings; wild camping on your own private island, swimming in sheltered coves, fishing from the rocks and cooking on an open fire. We have all the practicalities of your trip covered. We start you in the heart of Bohuslän; the Fjällbacka Archipelago, giving you plenty of time to explore the best of Bohuslän at your own pace. This trip is perfect for those looking for some chilled exploring of the Fjällbacka archipelago but also there are some challenging routes around the area; which if you choose to, you can take on. *We always recommend double kayaks for a more enjoyable social trip, however we can provide single kayaks at special request. We will collect you by minibus from Gothenburg Landvetter airport or any Gothenburg hotel and take you to the very best launch point in Bohuslän (1.45-hour drive,). We can do pickups anytime before 10:00. When you arrive, you will be provided with your kayaking and camping equipment. We usually use double kayaks, as we find this makes for a more enjoyable, social trip and you can fit in much more equipment. Odd numbered groups receive doubles and a single kayak for the extra person. We will then brief you about the trip, your safety and navigation equipment, and help you to plan the best route for your journey. Feeling fully prepared, the adventure is now yours. Enjoying the long Swedish summer days you can paddle into the evening, finding your own perfect piece of paradise to set up camp. As evening draws in, you can relax by the fire and admire the sunset glistening on the crystal clear waters. Cook up a hearty breakfast on the stove with your pre-purchased food, as you plan your day ahead. 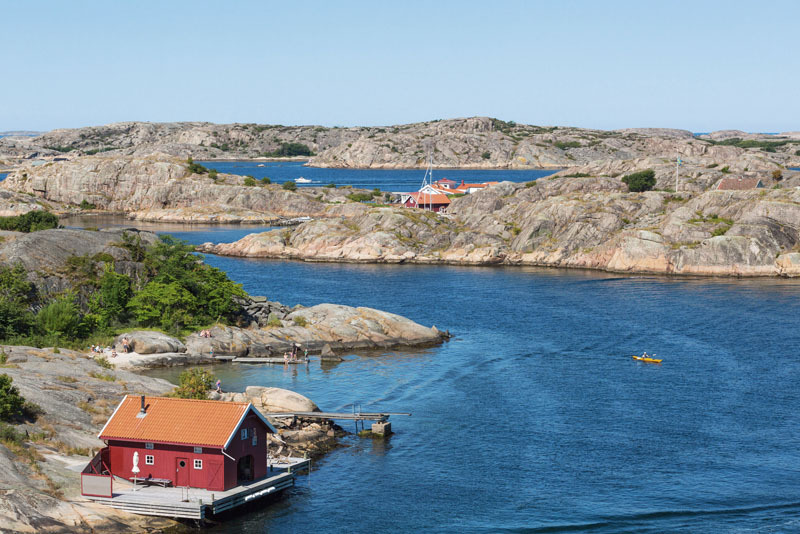 Is it a coastal wilderness kind of day; or perhaps you want to mingle with the locals and visit one of the of the picturesque fishing villages for Swedish Fika? Either way, the day is yours to spend as you wish. As you glide through the still waters along the coast, it’s time to find your next camping spot for the night; take your pick from numerous deserted islands. Set up camp and cook up an evening meal to be proud of over an open fire. No doubt yesterday, you were eager to jump in the kayak and get exploring; this morning you may opt to stay at camp a little longer and enjoy a morning swim in the crystal clear waters. 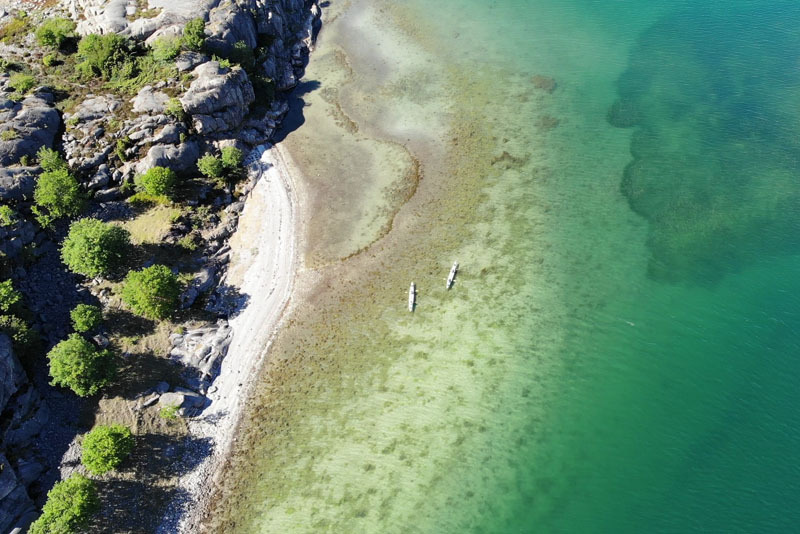 Feeling refreshed, you’ll be looking forward to more exploring from your kayak as you glide away from your island into Bohuslän's coastal wonderland once again. There will be plenty of opportunities to stretch your legs along the way too; Check out the points of interest marked in the guidebook, take a short hike along some of the walking routes in the area or even stop by some of the local villages to taste the seafood Bohuslän is so famous for. You may choose to try fishing for tonight’s dinner – what you catch, you eat; a fun game if your handy with a fishing rod but perhaps a little risky for any companions who are new to fishing. After finding a secluded sandy beach to set up camp, enjoy your final night witnessing a spectacular sunset and share food, drink, and stories with friends around the fire. Before getting into your sleeping bag for the night, you will text us which of the pre-determined pickup points you are expected to arrive at tomorrow and confirm your chosen pickup time. We can do pickups from Bohuslän anytime after 15:00. You’ll pack up camp for the last time as you head off to your chosen pick-up point to meet us. Don’t let the blues set in just yet; you still have plenty of time to take a slow journey back and take in the majestic terrain one last time. On arrival at the pick-up point, we will be waiting to take you to the airport or hotel. We highly recommend staying in a hotel after your trip. This way you can see the wonderful city of Gothenburg and have a stress free final day. Various routes available within the area; ranging from novice to challenging. Some kayaking experience is recommended but not essential. Common sense and a taste for adventure is required. Incredible place to kayak, breathtakingly beautiful scenery and a wonderful wilderness to explore! SKA is an awesome company to do it through! Great communication, excellent service and 100% reliable. We had an awesome time! The equipment provided was great, the kayak was top notch. Amazing service! The coastal islands are super cool to explore. All the oysters you can eat. What more could you want? A memorable adventure. Amazing trip will definitely be booking again next year. All the equipment and camping gear supplied by SKA was really good quality and the transfers and arrangements were perfect. Click on a month below to see the available dates. This trip departs every Wednesday, Thursday & Friday. To book your trip, click on your chosen month above to see the available dates. You can also Contact Us with any questions you may have. This longer expedition focuses on distance and is perfect for those; looking for a bit more of a challenge, who are fit and have some sea kayaking experience. 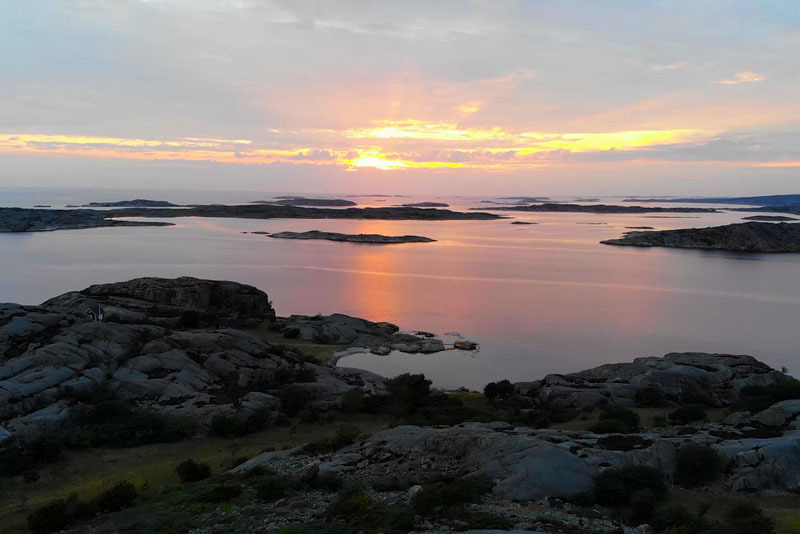 We will collect you by minibus from Gothenburg Landvetter airport or your hotel and take you to the village of Lysekil at the Bohuslän Coast (1.45-hour drive,). We can do pickups anytime before 10:00. When you arrive, you’ll be provided with your kayaking and camping equipment. We usually use double kayaks, as we find this makes for a more enjoyable, social trip and you can fit in much more equipment. Odd numbered groups receive doubles and a single kayak for the extra person. We will then brief you about the trip, your safety and navigation equipment, and help you to plan the best route for your journey. Feeling fully prepared, the adventure is now yours. 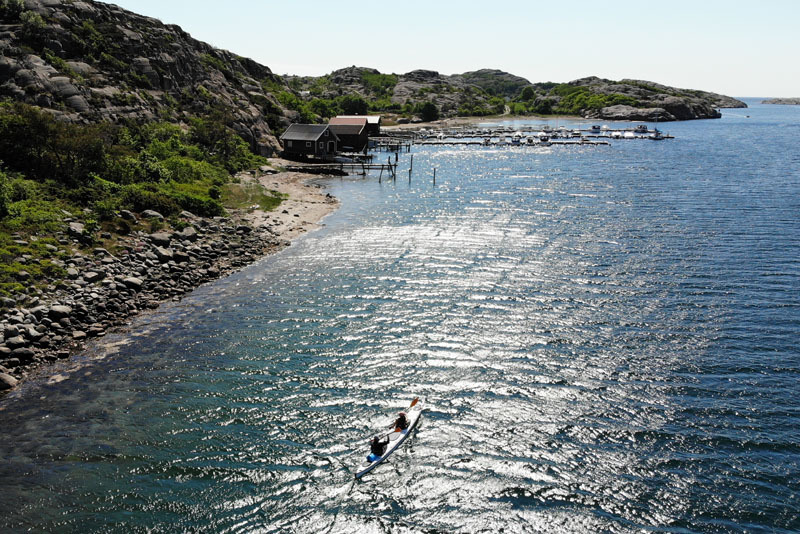 Your aim for today is to reach the granite islands around the fishing village of Smögen. Use the long Swedish summer evenings to your advantage as you paddle towards Smögen to choose the perfect spot for your first nights camp. 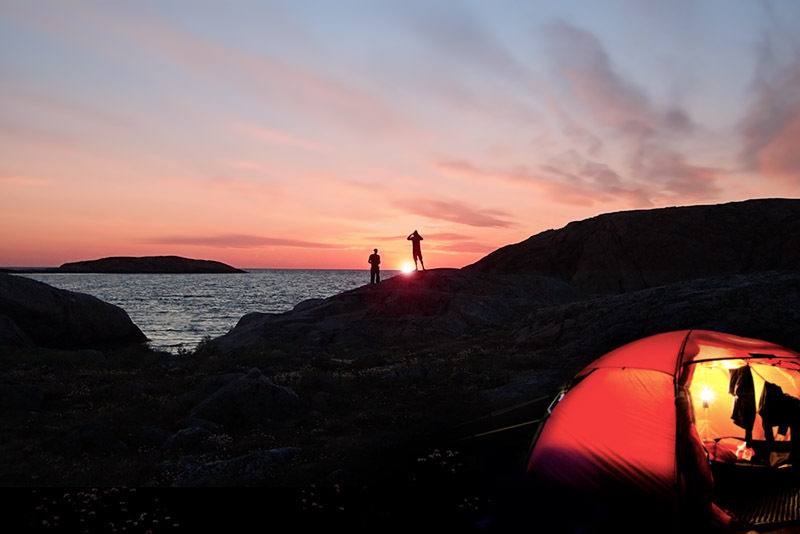 Admire the twinkling lights of the nearby fishing villages of Kungshamn and Smögen from your tent as you snuggle into your sleeping bag for the night. Cook up an early breakfast on your stove, as you're sure to be eager to checkout the village of Smögen, which is best known for its long picture perfect wooden pier and brightly coloured fishing huts. During the summer months this is one of Sweden’s most popular visitor destinations, with a large range of shops, cafes, pubs and restaurants. It's time to head through the impressive Sote canal which is cut through the rocks to avoid the waters west of the Sote peninsula, known for unpredictable strong currents. The canal offers a relaxing and interesting paddle through to the village of Hunnebostrand. Passing by Hunnebostrand and the Bottne fjord, it’s time to find your next private camping spot for the night; Set up camp and cook up an evening meal to be proud of over an open fire. A slightly easier day will mean you have plenty of time to stay at camp a little longer and enjoy a morning swim in the crystal clear waters. With the Fjällbacka archipelago in your sights, you will have the choice of heading through the sheltered channel past the village of Hamburgsund or through one of the wilder, beautiful but somewhat more exposed passages west of Hamburgö. Once you reach the majestic Fjällbacka archipelago, you will be spoilt for choice finding your own private island. You will know the routine by now; setup camp, have a dip, catch some fish, build a fire then admire the sunset glistening on the crystal clear waters. Famous for it's many high, steep islands, sandy beaches and protected coves, the Fjällbacka archipelago is 'the' real gem of Bohuslän. With its ever changing stunning landscape, at least two full days are needed to explore this fantastic archipelago. 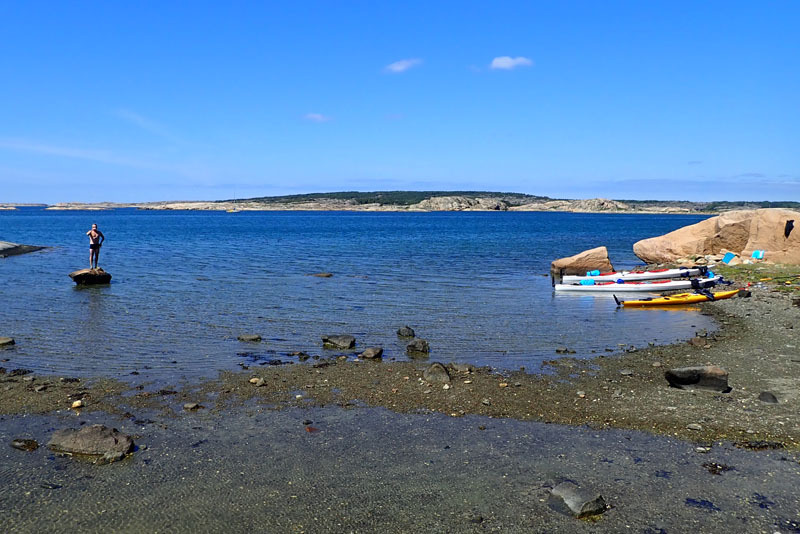 Head out to the outer westerly islands for a true coastal wilderness experience or stay within the sheltered channels and coves for a more relaxing way to explore. Worth a visit is the picturesque tourist town of Fjällbacka, where if your fishing skills have let you down, you can grab a seafood platter at one of the waterside restaurants. During the summer months the beaches around the Gluppö basin are a real draw for sun worshippers, scramble to the top of Getryggen for an amazing view of the archipelago, dig out your snorkel at Musö lagoon, follow the ancient labyrinths on Stora Måkholmen - every island has it's own unique charm. Some kayaking experience is recommended. Everything about the trip was as good as we could of hoped for. The kayak, camping equipment and services provided were outstanding. Can't recommend this trip any more highly. Thanks for such a memorable getaway! We really enjoyed being close to nature, having the freedom to explore the different beautiful islands in such clear blue water and walking up the rocky hills to get different scenic viewpoints. Sunrises and sunsets are stunning in this part of the world. Being able to camp on a beach and have the privacy of the whole island to yourself was really quite special. There is a calm peacefulness out there that makes a wonderful relaxing contrast to living in a busy loud city. Wake up by walking into the sea on your own private beach! Wonderful warm water, stunning views and as much adventure as you want. Organisation, information and equipment was all top notch. Click on a month below to see the available dates. This trip departs every Saturday, & Sunday. All the gear is top quality to ensure you have a fantastic day paddling around the archipelago and a comfortable night's sleep wild camping on the islands. Due to Sweden's 'freedom to roam' law, you are able to wild camp on almost any island within the archipelago. Use our customised guide book to find one of our recommended camping spots or explore to discover your own private island for the night. We will collect you from Gothenburg Landvetter airport or any Gothenburg Hotel or Hostel, and take you to the very best launch point in Bohuslän, the Fjällbacka archipelago (1.5 hours from the city centre). You will receive a map, compass and a customised guide book full of local knowledge, including the best islands to wild camp, top sights and recommended routes to follow. You will also receive quality safety equipment. Taking advantage of our food service, you can pre-purchase your food and drinks from our list before you arrive for your trip at cost price, so that it is ready and packed for when you arrive. If your thinking of extending your holiday to see Gothenburg we can hold onto your baggage for you until your kayaking trip is over. We think it is very important that you receive quality gear when setting off on your kayaking adventure, which is why we only send you out with top quality kayaking & camping equipment. This ensures you have the best possible trip with equipment that perfectly suits multi-day kayaking expeditions. We use Tahe fiberglass kayaks, Trangia stoves, lightweight Aquabound paddles, Silva navigation gear, Yak safety gear and Hilleberg tents. We typically use quality fiberglass Tahe Marine Tandem Maxi Kayaks. We find they are easy to handle and very stable. They offer plenty of space for all the equipment and with two people per kayak you can paddle for longer, making them ideal for multi-day trips. The composite hull is designed to be stable, with quick acceleration and a high end speed. We can offer single kayaks at special request but we highly recommend tandem kayaks for a more enjoyable trip. Our tents are top quality 2 person Hilleberg Rogen tents and supplied one per two people. The tents have two doors making them airy on warm days and cozy during cold nights. The Hilleberg reputation is well deserved. You will get wet, you will get salty hair and skin, toilet facilities are basic (a hole or bush), you will be wild camping and with it experience all the highs and lows of spending nights and days in an outdoor environment. If you think you will not enjoy any of these things then this trip may not be for you. We usually find that those with a medium level of fitness and are used to being in an outdoor environment have a better time. I'm a novice / intermediate, is this trip suitable for me? Some kayaking experience is recommended but not essential. In fact, many of our customers have never kayaked before. The advantage of a self-guided tour is that you can go at your own pace and stick to more sheltered areas if that makes you feel more comfortable. Our double kayaks are very stable and well suited for beginners and intermediates. Common sense and a taste for adventure is required. 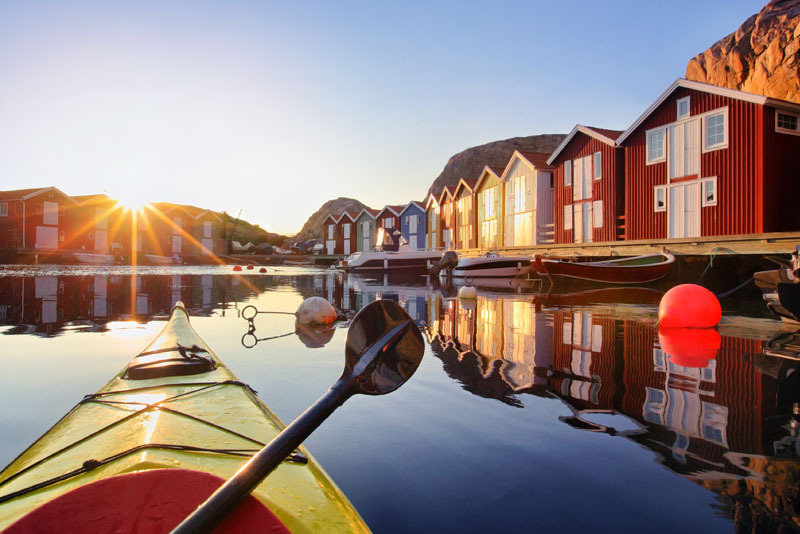 All our trips take place along the Bohuslän Coast, which is known as Sweden's kayaking paradise (CNN Travel). 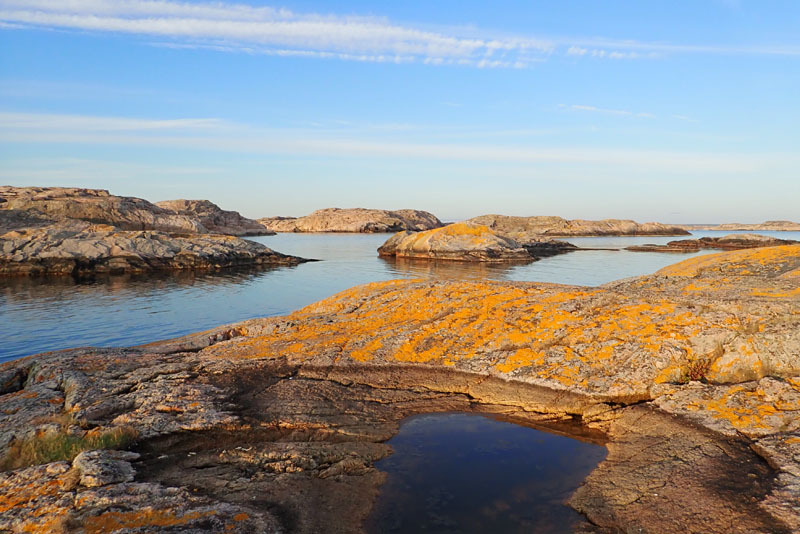 Many of our routes pass through the Fjällbacka archipelago, which in our opinion is the very best of Bohuslän. Where will we be camping? You are free to wild camp almost anywhere in the archipelago. Use our customised guide book for camping spot recommendations or find your own private island to camp on for the night. Is there a set route? Only if you want there to be. We provide you with a customised guide which details different routes around the area, all graded for difficulty, however it's really up to you whether you want to follow one of them. Our 4 day trip is more relaxed in terms of sticking to a pre-defined route, whereas our more challenging 6 day trip covers a larger area, so it is necessary to give more guidance. We have 5 different pick-up points along the coast meaning you are never that far from a pick-up point, simply text us where you are heading the night before the end of the trip and someone will be waiting to collect you on your final day. No, all our trips are self-guided. We will provide you with a customised guide book detailing recommended routes, points of interest, places to resupply and recommended camping spots. We will also talk you through the gear and routes before you set off, other than that your on your own to enjoy your trip at your own pace. There are hardly any currents or strong tidal waters around the archipelago and the many islands which make up the archipelago provide a natural barrier from the open sea. The kayaks we use are extremely stable, so you're very unlikely to fall in, but if you did, it’s just matter of pulling yourself back aboard. Obviously, as with any sporting activity there is always a risk. There are plenty of sheltered areas around the islands so knowing your limits, using the safety equipment and using common sense will help keep you safe. Do we have to be fit? You don't have to be fit to go sea kayaking but it helps. Being a self-guided trip, you get to decide your own pace and many of the recommended routes have short cuts, so even if you are slower than you expected, it's not a problem. We have a weight limit of 120kg per person. It can be hard to navigate when your so low in the water but it's all part of the fun. One of the group will be assigned as the navigator, they will have a kayak compass strapped to their kayak, will have a map and a hand compass. It will be their job to navigate your group through the islands. A bit of knowledge of how to read a map is useful but even if you are a novice, you will soon pickup the observation skills needed to stick to the route. A typical summers day has an average temperature of 24°C with water temperatures around 21°C. Generally, the temperatures are perfect for kayaking. It is Scandinavia, so there is always a chance of rain but if it does rain, it often passes quickly during the summer months. Being so far North, you can expect long days during June & July, where the sun barely dips below the horizon. What about food? Is it included in the price? We will send you a food list 30 days before your trip, you can then select and pre-purchase all the food you need, so that it is waiting for you when you arrive. Food is not included in the price, however you pay the same price as we do at the local supermarket. Included in the food list will be a range of foods which will cater for most dietary requirements. If you have any special requests, let us know and we will do our best to accommodate you. On some of the days, you will come across places to resupply and even grab a bite to eat. These are all marked in the guidebook. Why do you recommend double kayaks? The double kayaks we use are extremely stable and can fit plenty of gear for long trips. With two paddling, you will find you can paddle further and for longer. They also provide a more sociable and enjoyable trip. We can however, provide single kayaks at special request. Can you pick us up at X or drop us at X? We can pick you up or drop you off anywhere within the Gothenburg or Bohuslän region. This can be at a hotel, hostel, train station or airport. If you have any special requests, just let us know and we will let you know if it is possible. Can you hold onto excess luggage whilst we are kayaking? Yes, this is not a problem. My flight is arriving late / leaving early? 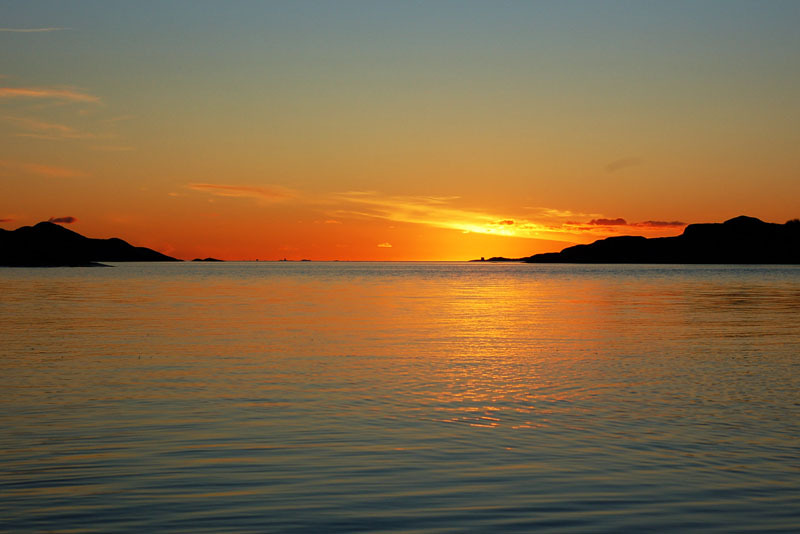 If you have a late flight on your arrival day or an early flight on your final day, we recommend that you book into a hostel or hotel in Gothenburg, This way you can get an early start and make the most of your time on the water. A full list will be sent to you before you arrive. Just send us an email. We are happy to answer any questions you may have.